Some of the oldest ocean energy technologies use tidal power. All coastal areas experience two high tides and two low tides over a period of slightly more than 24 hours. For those tidal differences to be harnessed into electricity, the difference between high and low tides must be more than 16 feet (or at least 5 meters). However, there are only about 40 sites on Earth with tidal ranges of this magnitude. Tidal energy technologies include barrages or dams, tidal fences, and tidal turbines. A barrage or dam is typically used to convert tidal energy into electricity by forcing water through turbines, which activate a generator. Gates and turbines are installed along the dam. When the tides produce an adequate difference in the level of water on opposite sides of the dam, the gates are opened. The water then flows through the turbines. The turbines turn an electric generator to produce electricity. Tidal fences look like giant turnstiles. They can reach across channels between small islands or across straits between the mainland and an island. The turnstiles spin via tidal currents typical of coastal waters. Some of these currents run at 5–8 knots (5.6–9 miles per hour) and generate as much energy as winds of much higher velocity. Because seawater has a much higher density than air, ocean currents carry significantly more energy than air currents (wind). Tidal turbines look like wind turbines. They are arrayed underwater in rows, as in some wind farms. The turbines function best where coastal currents run between 3.6 and 4.9 knots (4 and 5.5 mph). In currents of that speed, a 49.2-foot (15-meter) diameter tidal turbine can generate as much energy as a 197-foot (60-meter) diameter wind turbine. 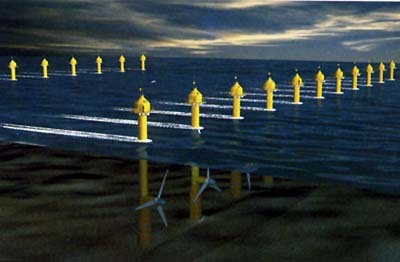 Ideal locations for tidal turbine farms are close to shore in water 65.5–98.5 feet (20–30 meters) deep. 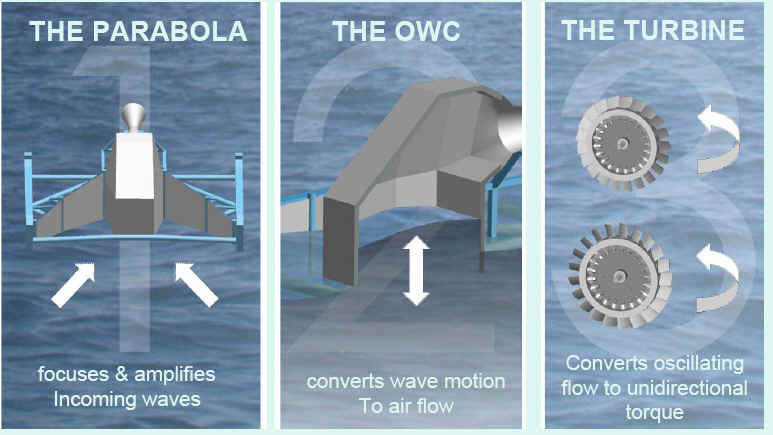 Wave energy can be converted into electricity by offshore or onshore systems. Offshore systems are situated in deep water, typically of more than 131 feet (40 meters). Sophisticated mechanisms—such as the Salter Duck—use the bobbing motion of the waves to power a pump that creates electricity. Other offshore devices use hoses connected to floats that ride the waves. The rise and fall of the float stretches and relaxes the hose, which pressurizes the water, which, in turn, rotates a turbine. •Oscillating Water Columns: Oscillating water columns consist of a partially submerged concrete or steel structure that has an opening to the sea below the waterline. It encloses a column of air above a column of water. As waves enter the air column, they cause the water column to rise and fall. This alternately compresses and depressurizes the air column. As the wave retreats, the air is drawn back through the turbine as a result of the reduced air pressure on the ocean side of the turbine. •Tapchans: Tapchans, or tapered channel systems, consist of a tapered channel that feeds into a reservoir constructed on cliffs above sea level. The narrowing of the channel causes the waves to increase in height as they move toward the cliff face. The waves spill over the walls of the channel into the reservoir, and the stored water is then fed through a turbine. 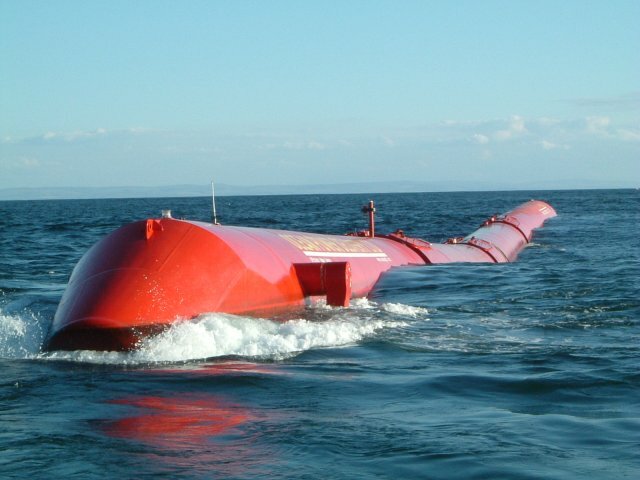 •Pendulor Devices: Pendulor wave-power devices consist of a rectangular box that is open to the sea at one end. A flap is hinged over the opening, and the action of the waves causes the flap to swing back and forth. The motion powers a hydraulic pump and a generator.